The ASA monthly newsletter is the most comprehensive compilation of Nordic news and events in the National Capital area. 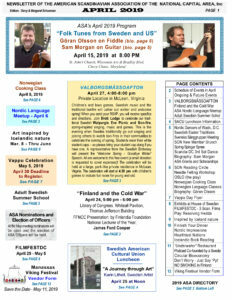 It features information about ASA programs, Scandinavian activities and classes in and beyond our local area, listings of Scandinavian film and TV programming, and much more in the greater DC area. Members receive the newsletter 10 months of the year, September through June. Below is a preview of our current newsletter. To view the above image as a PDF file, Click here. More information on several of these events can be found in Nordic Activities. To receive the ASA Newsletter and everything else that ASA has to offer, join ASA today!